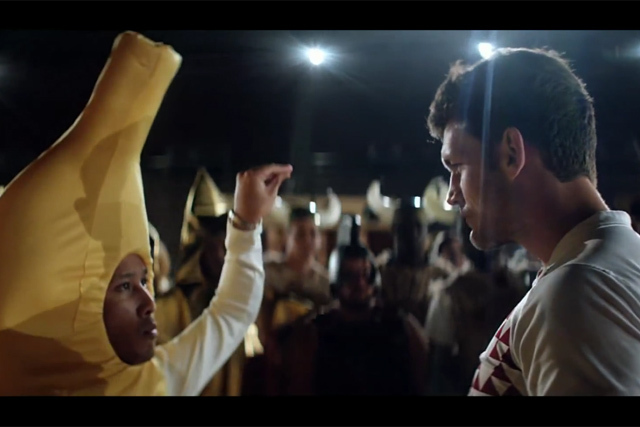 Men and women dressed as bananas, Tetris pieces, sushi and a washing machine take on the world's leading rugby sevens players in a surreal hip hop-style battle in this HSBC film. The 95-second clip promotes the bank’s sponsorship of the 2014 Cathay Pacific/HSBC Hong Kong Sevens, part of the HSBC Sevens World Series, where outlandish costumes in the stands have become a tradition. Players including England’s Dan Norton, DJ Forbes from New Zealand and US international Carlin Isles feature in the surreal ad, which uses the hashtag #BringYourGame.